High powered lasers are nothing new. We’ve reviewed several over the years. But have you seen one that can be switched between low and high powers with a turn of a key? Me neither, so that’s why I agreed to take a look at the 125mW Green Laser Pointer from SKY Technologies. 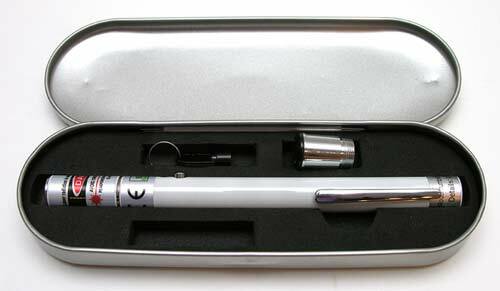 The laser comes packaged in an oval shaped metal tin. The body is constructed of high grade brass which acts as a heat sink for the laser pointer. It is powered by two AAA batteries which are not included. 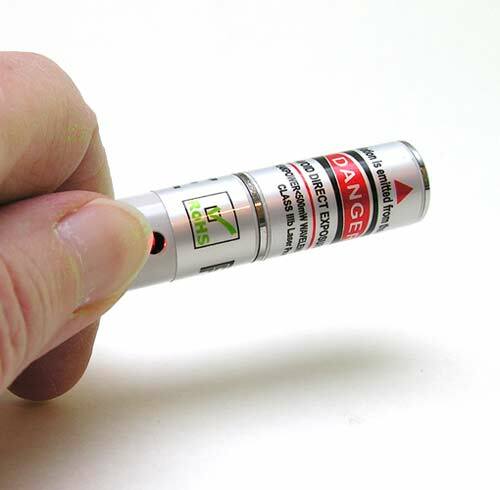 After you load the batteries into the barrel of the laser and screw on the metal battery cap, you’re ready this high (and low) powered laser pointer. The most unique feature of this particular laser is the key switched that is built into the battery cap. Using the provided plastic key (don’t lose it! ), you can turn the lock to Red (off), Yellow (low power) or Green (high power). The key is easy to fit in the lock and easy to turn. At the opposite end of the laser is the power switch and status LED. When you press the button, the LED will glow Red and the laser beam will project from the end of the barrel. 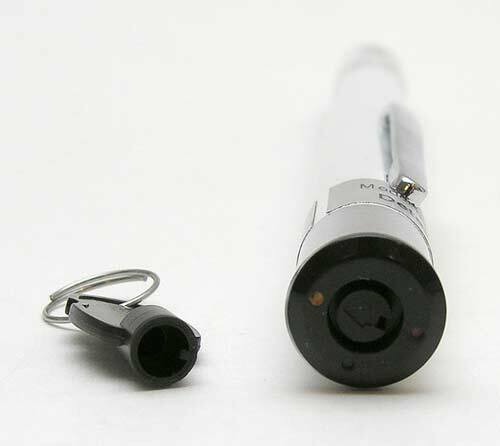 All SKYlasers green laser pointers are equipped with an infrared filter. 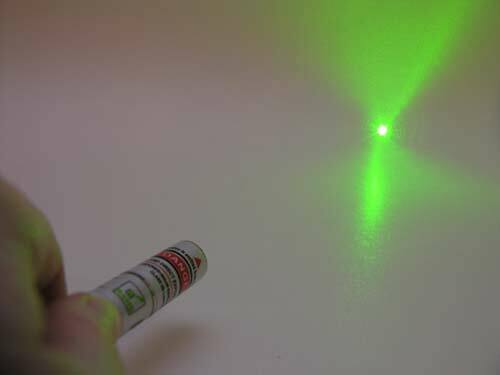 The IR filter is an important part of all high power green laser pointers. 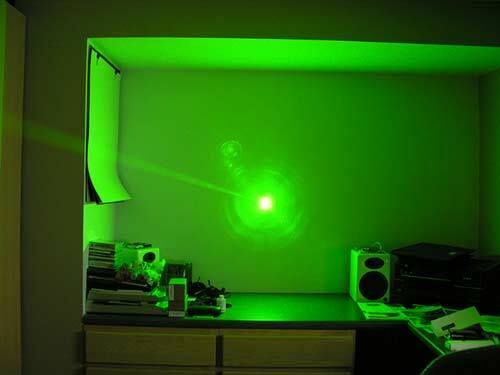 Green lasers without IR filters emit a fair amount of infrared radiation that can be potentially hazardous to your eyes. The IR filter minimizes this. That said, you definitely MUST to buy a pair of protective glasses to use with this device. They aren’t included with the pointer, but trust me, you need them. The beam on this (and other high powered lasers) is very very bright and it will hurt your eyes after a very short time. Sorry for the delay, I’m having some problems with the laser. The low power option doesn’t seem to work all the time. If I press the button, I’ll see the laser dot for a second and then it will turn off. I’ll have to keep pressing the button to get it to come on, but it only stays on for just second. The high powered laser works fine. The low power option is set to use just a portion of the battery, therefore, if the charge on the battery is low, there would not be enough power to pump the laser diode within the laser pointer. On the high power mode, the laser should work perfectly as all the power from the battery is used to pump the laser diode. 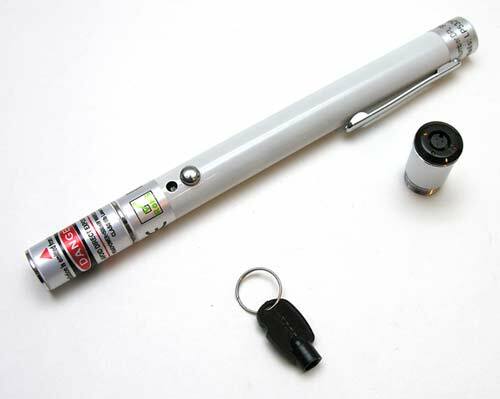 Can you try the laser pointer with a brand new set of batteries? I just tried the laser with newly charged NiMH 900mAh batteries and had the same experience. Can the laser only use alkaline batteries? Oh, I see. Yes, on rechargeable batteries, the low power setting will not function properly since rechargeable batteries usually only have 1.2V ~ 1.3V. On rechargeable batteries, the high power setting would have no problems functioning properly. However, as the low power setting uses around 20% of the batteries power, it would need a combined battery power of around 2.8V to pump the laser diode properly. I hope this explanation is not too confusing. If you have any other questions or need clarification, please don’t hesitate to email me at anytime. I tried another set of alkaline batteries that had never been used before and had the same result. I’m not sure how old the batteries were though. I’m going to buy a brand new set of Duracell batteries tonight and try one more time. Thank you for spending time to work on the review. 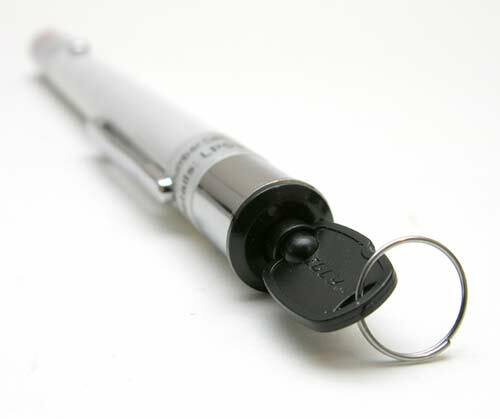 Another thing you can try is to turn the laser pointer on at high power for about 30 seconds. This will give the laser pointer a nice warm-up. 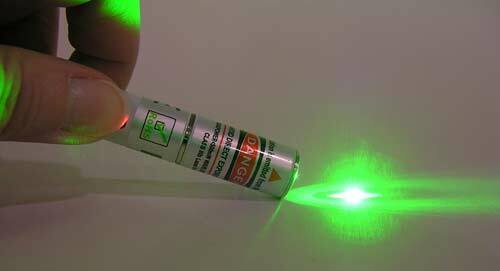 After warming up the laser pointer, try the low power setting again. Lasers are sensitive to two things, electric current and temperature. If both criteria is not satisfied, the laser will not work properly. At higher temperatures, the requirement for electric current is actually lower. This should help with the low power setting. But of course, you probably wouldn’t be buying a high powered laser to use it on low power anyway right? 😉 I did a few standard laser tests with this 125mW laser. I shined it on my hand to see if it would burn me (yeah, I’m crazy that way) and within 10 seconds or so, I could feel a sting. I tried to get the laser to burn wood but didn’t have any real luck. I tried to get it to burn some regular typing paper and again no luck. I was able to easily get it to burn holes in Black plastic trash bags. Burning dark objects is much easier because darker objects absorb more heat and light (Thanks to Rob “knower of all” for explaining that to me). When it comes down to it, I’m not quite sure why anyone would need a laser with the power to burn holes in plastic bags. Playing around with something as powerful as this is a bit scary. I always am afraid (even with the protective glasses), that I’m doing damage to my eyes. In the wrong hands, this laser could cause some serious damage. Kids should NEVER be allowed to play with these types of things. That said, if you’re an adult and fancy a high powered laser for various hobby related activities, the 125mW green laser from SKYlaser will probably do the trick. If you are such a person, I’d like to hear from you! What kinds of things do you actually do with a laser such as this one? This may be silly, but could you please try shining the laser on a popcorn kernel? The perfect tool to annoy at a super market unless making holes in plastic bags from a distance is not possible. What distance will it burn plastic bags at? Is the beam visible on overhead clouds at night time? Anything like the old fashioned searchlight? Have you tried Energizer Lithium batteries with it? The Ultimate Lithium batteries last 8x longer in digital cameras so I’d be curious how much longer they last in the laser. @Sue No, I tested Engergizer Rechargeables, RayOVac Alkalines and another brand of alkalines. All the batteries worked fine for high power. None of them work fine for low power. This is a pretty expensive laser for 125 mW. On Amazon.com, 100mW lasers can be had for only $49 + S&H. 50 mW lasers will reach lower clouds at night and the main purpose of green lasers is to use them as pointing devices for amateur astronomers. Green is much more visible at night than the red lasers. The higher the wattage, the brighter the beam is in twilight hours, but once it’s dark, a 5mW laser will work just fine. I have a 25mW attached to my 16″ telescope and use it to locate deep sky objects with the help of a star chart. The only thing i would use such a laser for would be to pop kids baloons, would be sooo funny.